There once lived a great lizard on Kili Island (now home of the people from Bikini). Not very far away, on Moneak island in Ebon atoll, lived a high chief and his people. There were very many coconuts on Moneak, but the high chief had put a “jabwi” (taboo) on all the coconut trees. They were not to be touched by anybody but himself. Then he went back to Kili. Then the people began to watch the island at night. The chief and the people were very angry about the stolen nuts. They knew the nuts had been taken, but they could not guess who had taken them. The chief made sure that a careful watch was set. Some people hid under the coconut leaves and some in the bushes. They had stones ready to hit the thief, even spears and other weapons. The next night, the lizard came again, and so the people knew that it had been the lizard from Kili who had stolen their nuts. They leaped out and caught him, struck him with stones, and spears. Then, they cut him into many small pieces, and each piece turned into a small lizard. 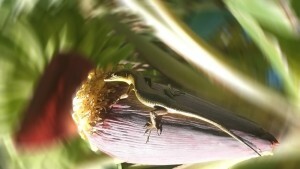 Thus, this is the reason why there are so many small lizards on the coconut trees today.